Civilians and rebel fighters were to start evacuating from Syria's Aleppo "within hours" under a deal reached Tuesday that would end years of opposition resistance in the city. Rebel officials, Russia and Turkey confirmed the agreement which, if implemented, would mark a major victory for President Bashar al-Assad over opposition forces who rose up against him in 2011. Russia's UN envoy Vitaly Churkin said the Syrian military had stopped its operations in Aleppo under the agreement, adding: "The fighting around eastern Aleppo is over." The agreement came amid mounting global outrage over reports of atrocities, including dozens of summary executions, as forces loyal to Assad closed in on the last pocket of rebel territory in Aleppo. Officials from several rebel groups told AFP it had been agreed to allow civilians and fighters to leave Aleppo for opposition-held territory to the west of the city. "An agreement has been reached," said Yasser al-Youssef from the political office of the key Nureddin al-Zinki rebel group, adding that the deal had been "sponsored" by Russia and Turkey. "The first stage will be the evacuation of civilians and wounded, within hours, and afterwards fighters will leave with their light weapons." As the UN Security Council met in emergency session to discuss Aleppo, Churkin said: "There is indeed an arrangement achieved on the ground that the fighters are going to leave the city." Turkish foreign ministry spokesman Huseyin Muftuoglu said that under the agreement civilians would first evacuate, followed by a withdrawal of rebel groups. "While we are pleased with today's step taken to secure a ceasefire, at the same time we must always be aware of the fragile situation in front of us and it is wise to be cautious," he told reporters. US Ambassador Samantha Power told the Security Council Washington wanted international observers in Aleppo to oversee the evacuation. She raised concern for "people who wish to leave but who, justifiably, fear that if they try they will be shot in the street or carted off to one of Assad's gulags." An AFP correspondent in west Aleppo said there had been no sounds of fighting or bombardment since around 3:00 pm (1300 GMT) Tuesday. The Syrian Observatory for Human Rights, a monitoring group, said a ceasefire was in place and confirmed there had been no fighting or air strikes in recent hours. The United Nations and aid agencies had been pleading for an agreement to allow for the evacuation of thousands of civilians trapped in rebel territory. After weeks of heavy fighting, forces loyal to Assad were in the last hours of a push to take full control of the city, dealing the biggest blow to Syria's rebellion in more than five years of civil war. The United Nations said it had received credible reports of at least 82 civilians, including 11 women and 13 children, being executed by pro-government forces in Aleppo in recent days. Speaking in Geneva, UN rights office spokesman Rupert Colville said pro-government fighters had in some cases entered homes and killed those inside, and in others "caught and killed on the spot" fleeing civilians. The UN was "filled with the deepest foreboding for those who remain in this last hellish corner of opposition-held eastern Aleppo," he said. Witnesses in Aleppo described scenes of carnage in rebel areas, with bodies lying amid the rubble of city streets, as desperate residents sat on pavements with nowhere to shelter. Syria's army has taken more than 90 percent of the territory once held by rebels in east Aleppo, after launching an all-out offensive last month to seize control of the entire city. Aleppo, a cultural and economic hub in northern Syria second only to Damascus in importance, had been split between a rebel-controlled east and government-held west since 2012. Recapturing all of Aleppo would leave Assad's regime in control of all five of Syria's main cities. As of early Tuesday, rebels were reported to be confined to just a handful of neighbourhoods, including Mashhad and part of Sukkari. It was unclear how many civilians remained in rebel territory, after an estimated 130,000 fled to other parts of Aleppo during the government advance. Jan Egeland, head of the UN-backed humanitarian taskforce for Syria, told AFP that thousands of civilians were in need of evacuation and safe passage, including hundreds of wounded. "We need a pause in the fighting but we also need to get the people inside to help organise an evacuation," he said. The International Committee of the Red Cross said there was only a "last chance to save lives" in Aleppo. "As the battle reaches new peaks and the area is plunged into chaos, thousands with no part in the violence have literally nowhere safe to run," it said. 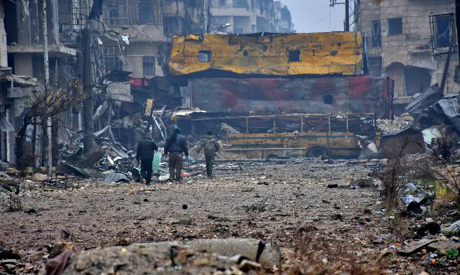 The government assault has been backed by heavy artillery fire and air strikes, with at least 463 civilians, including 62 children, killed in east Aleppo since mid-November, according to the Observatory. Another 130 people including 40 children have been killed in western districts by rebel rocket fire, the monitoring group says. More than 310,000 people have been killed since the Syrian conflict began in March 2011, and over half the population has been displaced, with millions becoming refugees.